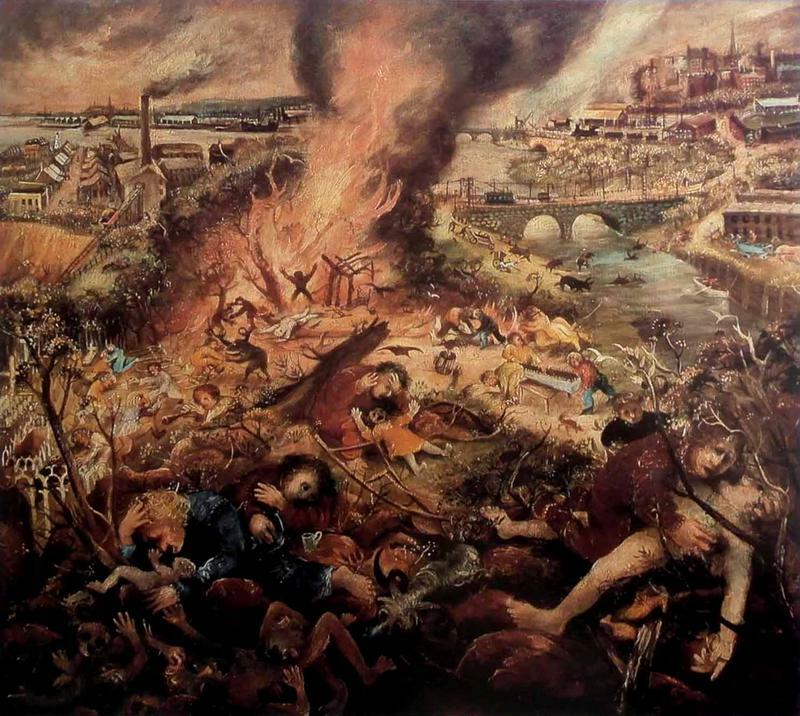 Arthur Boyd’s 1946-47 painting of Melbourne going up in flames is full of the horrendous. Biblical in its magnitude and conception, it is an outpouring of grief and pain; ghastly and hopeless as if sin itself is wreaking devastation. This is reckoning at its best: Melbourne paying for its part in a war that was raging to its north; or perhaps Boyd’s depiction is simply of a city shelling out for its presence. Like most paintings, it’s not until you see Melbourne Burning in the flesh, that you truly appreciate its vigour. The work, hanging presently in MONA (Hobart, Tasmania) sits for me, between the styles of the Flemish painter, Pieter Breughel, with his complex social scenes, and the Spanish painter, Francisco José de Goya, whose early 19th century work is painterly (by which I mean each brush stroke is evident and houses emotion). But whatever his influences Boyd’s outcome is striking. It captures, in graphic detail, the state of citizens’ psyches, as apocalyptic havoc reaches in and takes what it wants. Protection by some over others is useless as the central funnel of fire burns directly through the middle of the canvas.